As I said in my previous post, I'm off to Majorca! This post is just a little insight into my makeup bag and what sort of products I've packed with me. I'll just go straight into it. 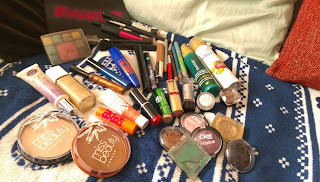 This is pretty much all my makeup (well the stuff I'm taking on holiday) and yes it does fit in the makeup bag. 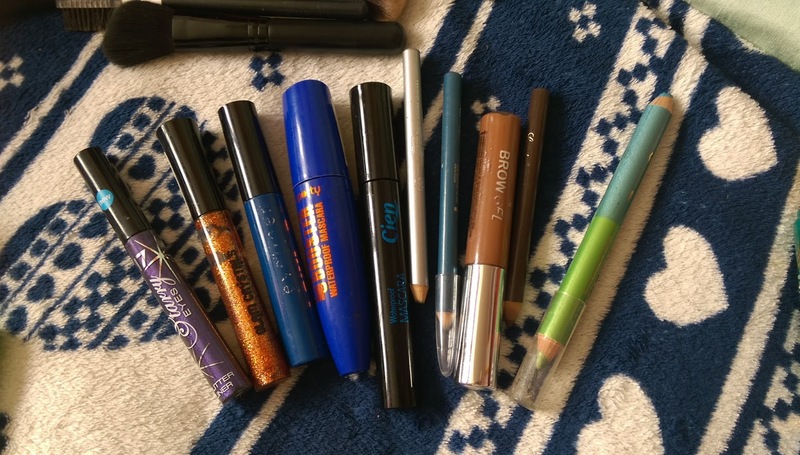 I've tried to sort it into different sections like the face products, lip products, eyeliners etc. The are the eye shadows. I don't actually own that many but I brought some colourful ones like the green and pink but also just the shimmery brown and black for going out. My collection isn't very big but it's a working progress. A lot of eye shadows are by MUA, which has VERY cheap products, you can find them in Superdrug and the quality is good for it's price. The copper one that I have here is quite creamy but applies a bit like a powder one. The black one however is more matte. 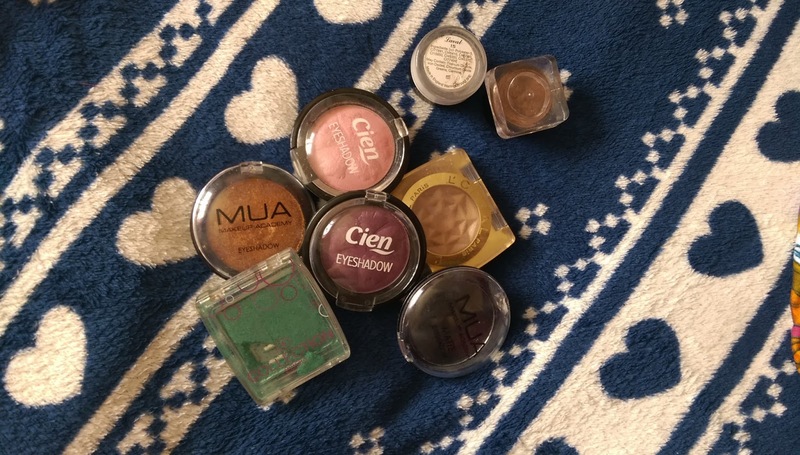 I also have some Cien eye shadows which is just the Lidl makeup brand but they have some nice products. Lastly the green one is by Collection. This is my face collection which consists of face power, bronzer, blush, foundation and concealer. The foundation is by Revlon and its the Nearly Naked. 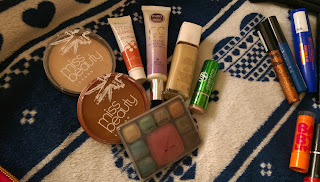 The other makeup is some cheap brands that I've found like the the Miss Beauty powder and bronzer I found in the poundshop, it's not that bad to be fair. 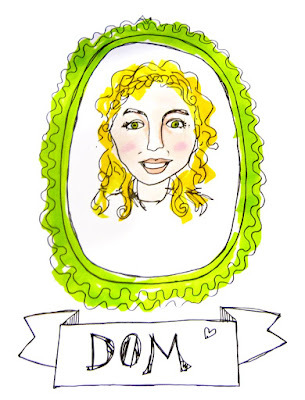 It gives a light natural coverage which is buildable. The cheek tint is by Rimmel and it's their Stay Blushed blush. I bought it because I never used a liquid blush so it was for experimentation purposes. I think it'll look lovely for a summer holiday. Blush is a definite necessity for a summer holiday. Moving on to the lips, I have my Baby Lips by Maybelline so I have nicesoft lips on my holiday. I love this lip balm because it makes my lips super soft and gives them a pink tint so I don't even have to wear a lipstick. 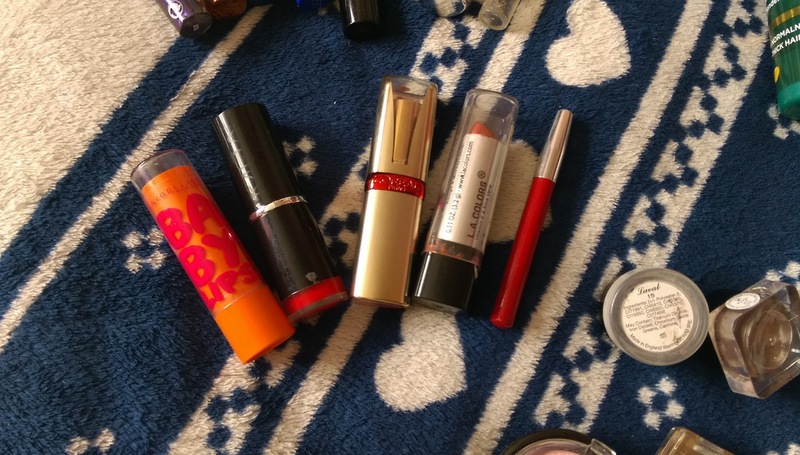 I also have the essential red lipstick which can style up any outfit, mine is by MUA. I've got a red lipliner and a pinky Loreal Colour Riche Serum. This gives me a variety of colours to chose from but still keeping things neutral. And here are my eyeliner, as you can tell I'm taking a few glittery /colourful eyeliners. I like to jazz things up a little bit. Then I have my waterproof mascaras. I've got a volumising one one by Cien which gives them a little colour without looking too obvious. Lastly my makeup brushes. 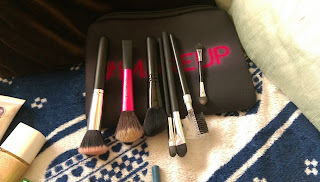 Again I don't have a big collection and they're all just some cheap brushes that I got from primark or superdrug but hey they do the job. I think I'd only start investing in brushes once I knew that makeup was something that I knew more about and it became a passion. Right now I'm just learning. So the first 2 brushes I use for foundation. The first one is flat so applies the product on very well without wasting it. Then I have a curved brush which I use for bronzer or blush. And lastly I have my eye shadow brushes, one for applying then the other for blending. Anyway thanks for reading, I hope everyone is enjoying the weather if its nice, if not, don't worry its only the beginning of the summer.